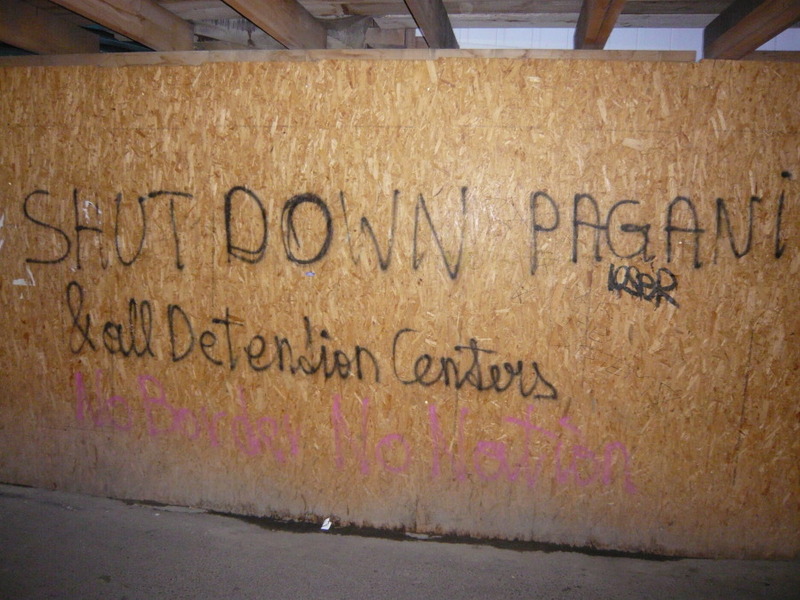 Published on October 20, 2009 in Deportation, Detention, Dublin II, Featured and Insight. 1 Comment Tags: assassini, athens, Deportation, frankfurt, human rights watch, iom, pressure control valve, protests, socialist party, vienna. The minister of “citizen’s protection” (sic!, former ministry of public order) of the new socialist party government announced the liberation of 1.200 migrants from detention centers and police departments (from the total of 5.500 migrants who are kept in detention for illegal entry). He presented this as a humanitarian move, but for sure this was necessary for the whole detention system, which was completely stuck after a summer with large police operations and arrests and the new arrivals. The released migrants will get the famous white paper (deportation decision with 30 days of tollerance to leave the country). He also announced large scale repatriation with IOM’s help and with european funding and once again declared “zero tolerance to illegal migrants”. During the past few weeks police violence against migrants and activists in Greece is becoming more and more intense. After the election of the new government, police has been given orders to intensify security checks all over Athens while areas like Exarcheia and Nikaia have been blocked in order to facilitate the “work” of the police. Arrests, body search and imprisonment of activists and migrants without justification have become commonplace. Following the death of Mohamed Kamran Atif, who has been tortured in detention at the police station of Nikaia, there was a mass demonstration. The police reacted violently, with tear gas, beatings and several arrests. During the weekend, Dimitris Parsanoglou, an anti-racist activist, has been arrested and detained without a legal representative for three days because he protested against the arrest and beating by the police of a migrant in a central spot of Athens. These tactics employed by the new government are part of an overall plan to “protect the citizen” by openly demonstrating the ability of the state to control those who participated in the December revolt. The rise of the extreme right wing group LAOS and the xenophobic reports of the mainstream media have played a vital role in this direction, emphasizing the need to secure Greece against foreigners and uncontrollable citizens. The Minister for the “protection of the citizen” ( the new name of the Minister of Public order) in a show of force announced proudly in a press conference that more deportations will be enforced, while he also added (in a sensitive humanitarian tone) that deportations of minors will be stopped. Although police violence is a tradition in Greece, I think that there is something new here. Instead of trying to cover up police violence, the tactic is to publicize it “showing off” the ability of the state to be in control as a protective father taking care of all those “concerned citizens”. Constructing migrants and activists as de facto threats makes police violence an “asset” in parliamentary politics, some kind of democratic achievement that seemingly draws more and more voters towards the party that can be more effective in its enforcement. In the meanwhile, Human Rights Watch has been quite outspoken about the situation in Greece: Greece: Unsafe and Unwelcoming Shores. However, they don’t get their demands right: EU Should Press New Government to Reform Asylum System and End Abuse, although they should know that europe is part of the problem, not of the solution. In Athens, there was a demonstration on the 17th of October. Indymedia Athens reports in greek language with some photos. So, activities are picking up, and Pagani is everywhere. Yet another friend from Austria sent us this picture from Vienna central station. Go organise international solidarity for the revolting prisoners in Pagani and all other refugee prisons (and let us know about them).